In recent times, champions of Steve Angello’s Size Records – AN21 & Max Vangeli have emerged as two of the most exciting and dynamic dance music duos in the business. Their trademark big room, melodic, progressive house has captured the hearts and minds of the EDM world. Tagged by many as a future Swedish House Mafia, the pair are well on their way to grasping the level of success that is predicted for them. Their armoury of anthemic releases resonates perfectly with the current direction of dance music in 2012 and as the venues they entertain grow bigger, so does their loyal fan base. It would be foolish to predict a future of EDM that didn’t have this pair right at its helm. We catch up with the superstar duo ahead of their hugely anticipated date with Eddie Halliwell on 14th August for Fire It Up at Papaya, on the picturesque island of Pag, Croatia. CGNY: So, firstly have you guys had the pleasure of visiting Croatia before? A&M: Yes! It’s an AMAZING place!!! CGNY: For anyone who hasn’t witnessed an AN21 & Max Vangeli set, what can they expect from you guys? A&M: Lots of energy and drinks being poured in the booth! It’s all about energy from us! CGNY: One track you’re sure to play for Fire It Up? CGNY: What’s happening with Size Records this summer? A&M: Big things but the main thing is our album of course! Steve has a lot of amazing records he is going to push as well on his end! CGNY: With the end of The Swedish House Mafia imminent, do you think Steve will be spending more time on the label? A&M: OF COURSE! That’s going to be the main focus for sure! CGNY: Dance music will need a new DJ super-group soon, who do you think has got the goods? CGNY: What’s been the highlight of 2012 for you guys so far? A&M: Working on and finally finishing our album! Super excited to finally have the fans hear it. CGNY: If you could bring back someone from the dead to work with on a track who would it be? CGNY: If you could go back in time five years and give yourself some advice, what would it be? A&M: Learn to play an instrument from day one! CGNY: What’s the greatest EDM track of all time? 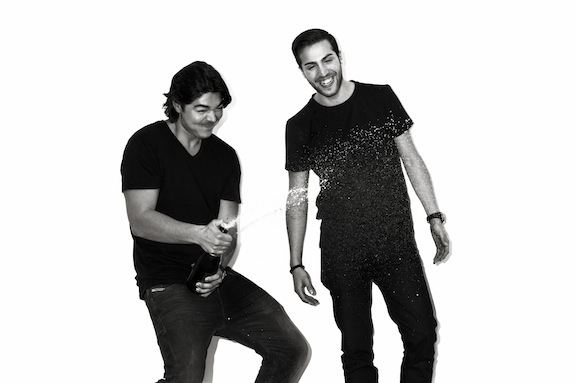 CGNY: AN21 vs Max Vangeli - Who’s the bigger studio geek? CGNY: Who’s got the best dance moves? A&M: The fist pump vs the air piano at the same time synchronized. CGNY: One of you is late and missed a flight, who is it? CGNY: Finally a message to the fans that are hyped up to see you at Papaya? A&M: Love you guys soo much! Can’t wait to see all of you!! !